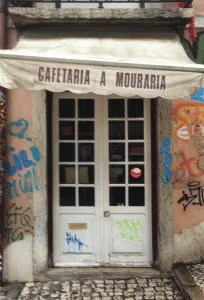 Mouraria may be one of the last bastions of hope in what seems to be quickly becoming Brooklyn, Portugal. Mouraria’s filth, character, colorfulness, and diversity are the exact opposite of the carefully crafted simulacrum of these urban elements at, say, LX Factory. As an eight-month resident of the neighborhood, I have had the privilege of exploring its shady winding streets at all hours of the day and night. And I have discovered quite a bit of inspiration and strength in terms of food, music, and art; some of it I would like to share with you below. *Proceed only if you own no selfie stick. The Flamingo Bar was mentioned in our Best of Lisbon 2016 list as being a quite noble hole in the wall. It’s still there, with the same friendly staff, reasonable prices, and unique attention to detail in terms of customers, drinks, and the soundtrack. When the surrounding area quiets down (around 23h), this place will still give you refuge. Atop Escadinhas (soon to be Escalador) de Saude, to the right, there is a great little Clandestine Chinese Restaurant. It is run solely by Amigo Lee, his wife, and daughter, whose names I forget. 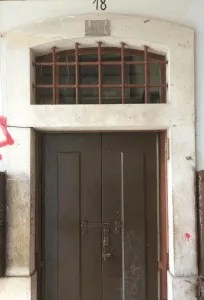 Having climbed the steps of health, look up and to the right for a red lantern in the third-floor window, and, on the buzzer near the door, a humble yellow tag with Chinese calligraphy on it. The decor literally feels like home, because, well, it might be. The calligraphy on the walls, as well as the mind-boggling carved carrots made to look like roses and served with most meals, are all hand-made by Lee and his wife, respectively. Neither Portuguese nor English is spoken, but some French is, and the menu has pictures. The service and food are enough to keep me and my roommates going there several times a week. I suggest the cabbage in garlic sauce, A9 on the menu. 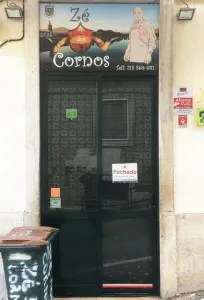 At the foot of the neighborhood, East of Hotel Mundial, you will find Tasca de Zé dos Cornos, a humble authentic Portuguese restaurant. By authentic I mean the menu and the staff. They do speak English, and the atmosphere is lively and fun: mostly locals, families, and the occasional Portuguese girl with a Swedish hipster the morning after. I have yet to meet Zé but, judging by a painting of him above the kitchen window, he seems like a decent chap. The fish is to kill for. In the evenings and on weekends, the hungry crowd outside can rival the line to the first McDonald’s opened in Moscow in 1990, which is saying a lot (trust us). Although the wait-time is significantly shorter and definitely worth it. Renovar A Mouraria is a mostly outdoor bar known to any local here. There is a music stage in front that hosts all sorts of fun during the warm days. They sometimes have trivia night, etc., and I have never seen it empty. 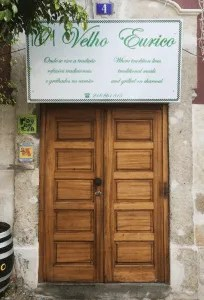 The beer and wine are cheap, and they have a modest food menu that is worth every euro. The portions are big. You’ll recognize it from all the flags and rags decorating the entire residential street around it. A great companion to the fallen Anos 60, this is a good place to enjoy some live music (not just fado), have a made-with-love tosta mixta, and shoot the breeze with a friend on the steps outside. 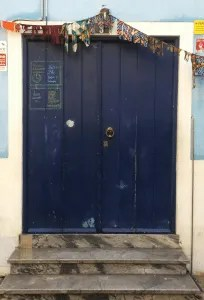 The bar closes around 23h, usually when the cleaning lady nonchalantly starts sweeping garbage and stragglers down the steps, back to Martim Moniz. In the Eastern main vein of the neighborhood, buried between sets of staircases and amazing graffiti walls, sits Boutique Taberna. It is one of the few bars in the area but it’s difficult to miss. The decor is — and I don’t use the word lightly — somewhat vintage: arm chairs, books, sofas, a few old TV sets. Andy, a local Brazilian expat, plays ’90s hits on Thursdays, Fridays, and Saturdays. If you ask him nicely, he is more than happy to have you embarrass yourself on the microphone to his acoustic accompaniment. The staff includes the owners, all of whom are a great bunch. There are locals and tourists alike, and the second floor (which feels like Sherlock Holmes’ opium den) is open to the right kind of people. They host private events and have a colorful yet limited bar. 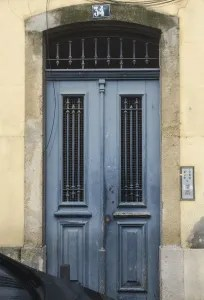 Up the stairs from Boutique Taberna, in the direction of Graca, there is Velho Eurico — a great unpretentious restaurant with a Portuguese menu and charming staff. The place usually fills up by the evening, everybody inside has a smile on their face, mainly due to the amazing energy and sense of humor of the (partially) Brazilian waitresses. I think they take reservations but walk-ins are welcome too. Come earlier on a weekend. The prices are fair, the food is good. 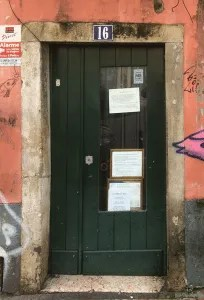 At the beginning of Escadinhas de Sao Cristovao, which are covered with amateur and not-so-amateur graffiti, there is a tiny bookshop whose name I do not know. When I say tiny, I mean it is the tiniest bookshop I have ever seen. The books are mostly in Portuguese, and it is difficult to turn around when inside. It feels like being inside a bookshelf. But, if you are looking for some Portuguese books, the old man inside seems to have a serious passion. It’s an awesome little spot, even if you can’t read. Finally, if you explore long enough, you are bound to come across what I consider to be one of the strongest pieces of graffiti in Lisbon. Being from NYC, I have never been a fan of selfie sticks. I have also realized a new-found hatred for the Brooklyn-born Ronaldo/Beckham haircut + beard look that a large portion of the male population seems to adhere to so much. This piece spoke to me. It makes me want to speak Portuguese so I may one day meet its maker(s) and share a beer with him or her or them. Its location must remain secret for the sake of humankind.